Sibanye Gold has agreed to acquire Stillwater Mining in a cash transaction valued at about $2.2 billion. Sibanye is headquartered in South Africa and is that nation’s largest producer of gold from domestic mines. The company has recently expanded into production of platinum group metals (PGM) through the acquisition of mining assets. Stillwater is the only U.S. miner of platinum group metals, with two mines and a metallurgical processing complex in south-central Montana. 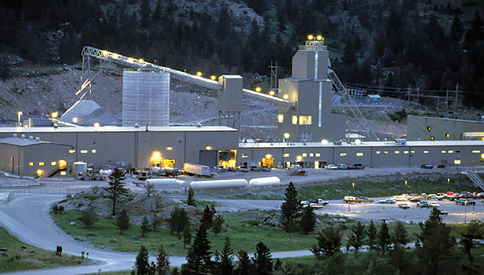 Stillwater Mining extracts platinum group metals from the J-M Reef in south-central Montana. Implementation of the transaction is subject to Stillwater and Sibanye shareholder approvals, as well as applicable regulatory approvals in the United States and South Africa. Sibanye has secured bridge financing of $2.7 billion provided by Citigroup Global Markets Ltd. and HSBC Bank to fund the transaction and repay certain existing indebtedness of Stillwater. The companies expect the transaction to close in the second quarter of 2017. Assuming completion of the transaction, it will be Sibanye’s third major acquisition of PGM assets in a little more than a year. 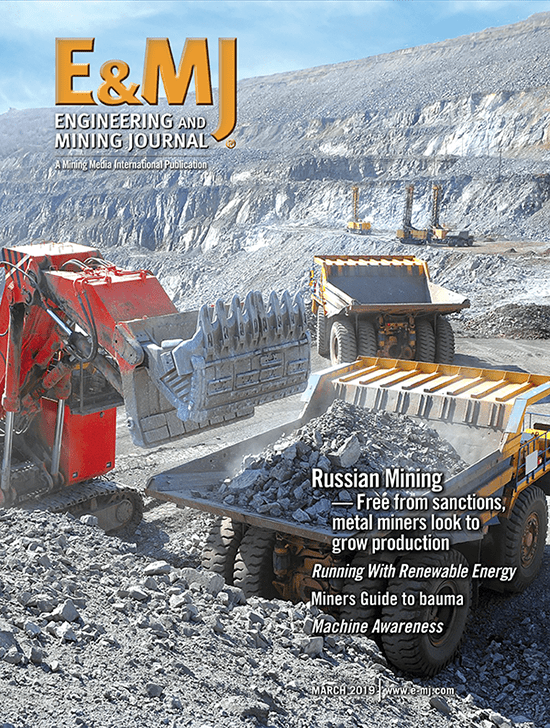 In early October 2015, the company announced a $294 million cash offer for Aquarius Platinum, following up on an agreement announced a month earlier to acquire the Rustenburg mining operations of Anglo American Platinum (Amplats) on the Western Limb of South Africa’s Bushveld Complex in a transaction valued at about $326 million. The Aquarius transaction closed April 12. The Rustenburg transaction was effective November 1. Sibanye’s announcement stated that the Stillwater transaction is strategically compelling in that it expands the company’s PGM portfolio with Stillwater’s high-grade reserves, which currently support more than 25 years of mine life, while also providing near-term, organic, low-cost growth through Stillwater’s Blitz project. Furthermore, the extensive strike length of the mineralized J-M Reef, which hosts the Stillwater mines, suggests there may be upside exploration potential. 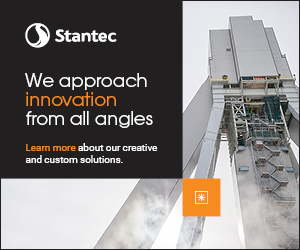 Also, Stillwater’s Columbus metallurgical complex will provide Sibanye with a “mine-to-market” PGM business, while its sizeable recycling operations, which recover PGMs from spent catalytic converters and other industrial sources, will provide a steady margin and strategic market insight. Rio Tinto has committed to generating $5 billion of additional free cash flow over the next five years from a productivity drive unveiled in late November as part of its long-term strategy. In a presentation at an investor seminar in Sydney, Rio Tinto Chief Executive Jean-Sébastien Jacques underlined the strategy centered around a strong focus on safety, cash generation, a world-class portfolio, commitment to capital discipline and the delivery of superior shareholder returns. Rio Tinto intends to raise productivity across its $50 billion portfolio of assets by focusing on operational excellence to generate superior shareholder returns throughout the cycle. This is expected to generate a total $5 billion of further free cash flow by the end of 2021 in addition to the cash cost reduction target of $2 billion across 2016 and 2017. “We have placed our assets at the heart of the business to drive improved performance and ensure our resilience through the cycle,” Jacques said. “We are well on track to meet our target of $2 billion of cash cost savings by the end of next year. We are also taking advantage of any opportunity to generate value from mine through to market. Lifting the productivity on our $50 billion asset base creates a low risk and highly attractive return. It will deliver an additional $5 billion of free cash flow over the next five years. “We are continuing to reshape our portfolio. Following our announcement yesterday that we will sell our Lochaber smelter in Scotland for $410 million, the total of agreed divestments in 2016 now stands at $1.3 billion,” he said. The transaction includes Rio Tinto’s interest in Alcan Aluminium UK Ltd., which includes an operating smelter, the hydroelectric facilities at Kinlochleven and Lochaber, as well as all associated land. SIMEC’s intention is that the smelter will be operated by the Liberty House Group, its sister company within the international GFG Alliance. In addition to improving the performance of its asset base, Rio Tinto is also committed to investing in growing the business. In the near term, this will be delivered via three high-quality growth projects—Silvergrass (iron ore in Western Australia), Amrun (bauxite in Queensland) and Oyu Tolgoi (copper and gold in Mongolia). This investment underpins an annual average copper equivalent growth in excess of 2% between 2015 and 2025. Longer term, exploration remains a priority for Rio Tinto. Regarding iron ore production, Rio Tinto set out the high-value options available to optimize its Pilbara system, with a focus on value over volume. This includes potential enhancement of mine capacity through productivity improvements and replacement of depletion through low capital cost brownfield investment, including Yandicoogina Oxbow and West Angelas Deposit F. The approximately 20 million-metric-ton-per-year (mt/y) Silvergrass project with a capital intensity of $29/mt and an IRR of more than 100% remains on track for completion in the second half of 2017. Over the next three years, sustaining capital expenditure in the Pilbara is expected to be around $2.2 billion and replacement mine capital expenditure around $1 billion. One option following the brownfield replacement mines is the next greenfield Pilbara development, Koodaideri, with capacity of around 40 million mt/y and capital expenditure of around $2.2 billion from late 2019. First ore will potentially be available by 2021. The AutoHaul project is expected to advance progressively during 2017 and be fully implemented by the end of 2018. Pilbara shipment guidance for 2017 remains at 330 million-340 million mt/y of iron ore.
Rio Tinto Aluminum remains globally the highest margin aluminum business, according to the company. The aluminum product group is on track to deliver 2016 cost savings of $300 million. Initiatives are under way in the aluminum business to further reduce costs and increase productivity, including more than 250 initiatives in bauxite and more than 500 initiatives in each of the alumina refining and aluminum smelting businesses. The Amrun bauxite project remains on schedule and on budget. Production guidance for 2017: Aluminum, 3.5 million to 3.7 million mt; alumina, 8 million to 8.2 million mt; and bauxite, 48 million to 50 million mt. At the end of 2015, the top 20 gold-producing companies held more than 760 million ounces (oz) of gold reserves—sufficient for 16 years of production at 2015 rates, according to SNL Metals & Mining. They accomplished this while increasing their combined production 7% over the previous 10 years, from 39.7 million oz in 2006 to 42.5 million oz in 2015, and producing a total of 403 million oz of gold. At the same time, the 20 major gold companies replaced an average of 151% of their production over the period through a combination of acquisitions and exploration. They added 670.9 million oz of reserves through acquisition and exploration with costs totaling $77.7 billion between 2006 and 2015, for an average cost of $115.81/oz of gold. Among the 20 companies, 16 had positive reserves growth, net of production, and four had negative net growth, with Polyus Gold and Newcrest Mining leading with the highest growth. 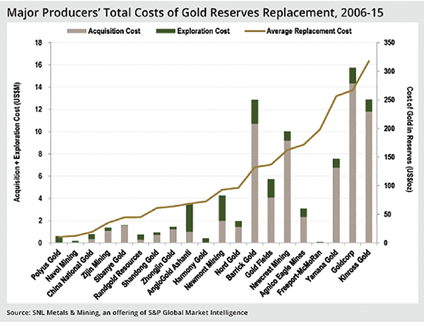 In terms of reserves-replacement rate, China National Gold topped the list, replacing 400% of its 9.4 million oz of production, and Polyus Gold and Zijin Mining shared second place, each with a replacement rate of 370%. Nineteen of the 20 companies made acquisitions during the period, buying more than 253 million oz of gold reserves for $61.02 billion, for an average cost of $241/oz. Barrick Gold topped the list, having acquired more than 60.4 million oz of gold reserves between 2006 and 2015 at an average cost of $177.25/oz. Gold Fields took second place with the acquisition of 37.4 million oz. The group developed 417.7 million oz of gold reserves by budgeting $16.68 billion, or $39.93/oz, for gold exploration. Polyus added 55.8 million oz by budgeting $567 million, or $10.17/oz, followed by AngloGold Ashanti, which added 44.2 million oz with exploration budgets totaling $2.53 billion, an average of $57.29/oz.